Since Brendan Peyper’s appearance on the music scene 3 years ago, his career has gone from strength to strength. 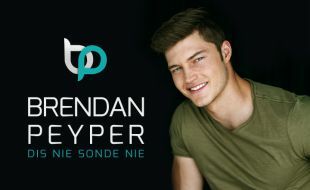 Brendan will be performing songs from his much anticipated new album “Dis Nie Sonde Nie” the album has Brendan’s unmistakable spark which flows strongly in this new album along with pulsating rhythm, melody and harmony’s that will make you want to live life more fully. Watch this not to be missed performance at The Barnyard Theatre.